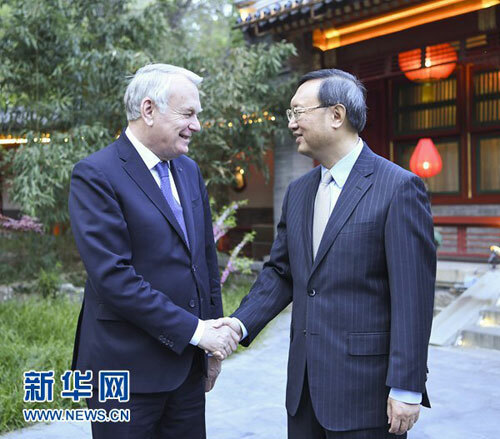 On April 13, 2017, State Councilor Yang Jiechi met at Diaoyutai State Guesthouse with Minister for Foreign Affairs and International Development Jean-Marc Ayrault of France. Yang Jiechi expressed that China-France comprehensive strategic partnership has enjoyed stable development, and both sides have achieved positive progress from various fields such as high-level exchanges, economic and trade cooperation as well as people-to-people and cultural exchanges in recent period. As permanent members of the UN Security Council and major countries with international influence, China and France should further enhance communication and coordination, deepen practical cooperation, and continuously make contributions to advancing the great cause of world peace and development. Jean-Marc Ayrault said that attaching high importance to the relationship with China, France supports the "Belt and Road" initiative, and is willing to, together with China, continuously intensify high-level exchanges, deepen cooperation in various fields, and jointly adhere to multilateralism, deal with climate change and safeguard trade liberalization.